It’s one of the facts of community living: Where you have neighbors, you can have problems. There are some things you can do about annoying neighbors and some things that could land you in legal trouble. Start by talking to your neighbor. Share what’s bothering you. Keep your composure and try to approach the conversation from a place of kind­ness and curiosity. You could even help rectify the situation, if you’re willing. For example, if you’re really both­ered by someone’s weedy flowerbeds, offer to help. You might find out that something is going on in your neighbor’s life (an illness, for example) that’s preventing them from taking better care of their yard. If you feel the situation is too dangerous to attempt a conversation on your own, consider involving the police or your local code enforcement department. Either one can help you evaluate whether the situation falls under their jurisdiction. If your neighbors are renters, you might also start by reaching out to their landlord. You can find this information by looking up local land records online or visiting your county assessor’s office. The landlord may have no idea that problematic behavior is occurring and could rectify the situation with the threat of eviction. Barking dog: If conversations get you nowhere, you might call the local police with a nuisance complaint. Then again, barking dogs may not be a priority for law enforcement. If that fails, you could enlist help from a lawyer to file a suit (or threaten one) for nuisance behavior. Blocking your view: Unless protected by a local ordinance or subdivision rule, you do not have a right to your view. Neighbors are free to plant trees or erect permitted structures that block your favorite sightline. If tree trim­ming would improve your view, you may offer to pay for it. Never conduct the work yourself or hire someone to conduct it without written permission. 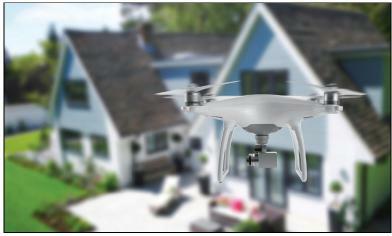 Flying a drone over your backyard: Find out if your state has drone laws covering hobby users. If not, you may still have a legal case for trespass, private nuisance, or invasion of privacy. Messy backyard: Check your local laws. There may be regulations regarding trash or unkempt lawns. Once you alert your local officials, your neighbors could be fined for non-compliance. Constant partying: Your immediate remedy for loud music and yelling is to call the police. Repeated com­plaints to local authorities can help you build a case for a nuisance suit. Ugly fences: Unless your community has a local statute regulating fences, you generally can’t force your neighbor to replace an unsightly fence or other fixture in their backyard.Talk to your local police department and local municipal staff about how to address a nuisance neighbor. They can help you strategize ways to solve the issue, with appropriate support.Neighborly conversations are generally advisable as the first course of action. If the problem persists, consult a lawyer to review your options. Mediation might be appropriate, before you head to court. We rely on doctors and hospitals to give us the best treatment possible. This includes the decisions they make about the type of medicine they prescribe or the types of medical devices they use. But despite our doctors’ best efforts, implants, artificial joints, artificial heart valves and other devices sometimes cause complications ranging from unpleasant side effects to serious harm or even death. Many women decide to have artificial breast implants for cosmetic reasons. Others do so because they’ve undergone a mastectomy due to breast cancer. But a new study by French researchers suggests that breast implants can be particularly dangerous for women who have undergone multiple implants or had breast cancer in the past. The study indicates that women who fall into this category have a heightened risk of a rare cancer known as BIA-ALCL (which stands for “breast implant-associated anaplastic large cell lym­phoma”) which develops in the tissue that surrounds an artificial breast. The study indicates that textured breast implants, as opposed to smooth breast im­plants, pose the highest risk. Knowledge of this risk isn’t totally new. The Food and Drug Administration released a report suggesting a possible link between breast implants and ALCL in 2011. But recent studies such as the French one indicate that the risk is more serious than we thought. If you or someone you love has had implants, particularly textured ones, or you’re con­sidering getting implants for any reason, be sure to discuss these risks with your physician. If you have been diagnosed with BIA-ALCL, be sure to talk to an attorney to find out what rights you may have. This system is a commonly used implant for people who need knee replacements. The implant was approved by the FDA in 2010 and orthopedic surgeons have been using it widely for the last five years. Unfortunately, there have been reports of nearly 1,500 incidents of “mechanical loosening” caused by the failure of the implant to bond properly with the patient’s tibial baseplate, causing severe pain, loss of knee function and removal surgery. If you’ve had a knee replacement, check with your surgeon to determine whether it’s a DePuy Attune. If you and your doctor have discussed the need for a knee replacement, be sure to discuss the risks of this type of implant. When a doctor needs to diagnose a condition, he or she may order you to undergo an MRI (magnetic resonance imaging) procedure in which a magnetic image of the inside of your body is created to give him or her a better look. Sometimes, the radiologist performing the MRI will inject a “contrast agent” into your bloodstream to make the image clearer and easier to read. Generally, an MRI is a safe procedure, but recent studies indicate that a metal called gadolinium, found in many contrast dyes, can cause a condition called “gadolinium toxicity,” resulting in symptoms that can include tremors, confusion, weakness, fatigue, muscle cramps, and even kidney damage. Though contrast dyes are safe for many patients, oth­ers (such as pregnant women, children and patients with kidney conditions) may have a higher risk of complications. If you or a family member are in this category, it’s important to let your physician know before under­going an MRI. If you think you may be experiencing such complications in connection with an MRI, talk to your doctor as soon as possible and ask an attor­ney about your rights. Invokana is the first in a new series of diabetes drugs that change a patient’s kidney function to ex­crete sugar through the patient’s urine. It has become a popular and profitable medication over the last five years. But during this time, it’s also been linked to reports of kidney damage, urinary tract infections, weight loss and even kidney failure. The FDA has also warned that Invokana increases the risk of leg and foot amputations. There are allegations that the drug maker failed to warn patients and doctors properly about the risk of these side effects, and the FDA is now requir­ing the manufacturer to include a “boxed warning” about the risk of amputations, which is the strongest warning there is. That means that if you’re taking Invokana, you need to talk to your doctor right away about the risks. If you’ve suffered any complications that could be linked to this drug, you should also talk to an attorney. Is an absent spouse an ‘abandoning’ spouse? When a person dies “intestate,” that means they’ve passed away without having made a will. If that happens, their property is doled out to surviving family members according to that state’s “intestate succession law.” This means the state is essentially creating a will for the person according to its idea of how most people would set one up, typically with a surviving spouse first in line, followed by kids, grandkids, parents, siblings and so forth. Take a case currently pending before the Michigan Supreme Court. James Erwin Sr. died intestate in 2012, leaving six children from his first marriage and four children from his second marriage. A dispute broke out in his family about whether his second wife, Maggie, was entitled to a surviving spouse’s share of his estate. Though she and James had been legally married for more than 40 years, she hadn’t actually lived with him since 1976. That year, Maggie moved out of the marital home, sought child support and remained separated from James until he died. But the judge ruled that Maggie could still get her share because she and James had stayed in contact and maintained a relationship. The Michigan Court of Appeals agreed, noting that despite their living apart, James had gone to court to keep Maggie on his employee health plan and she had kept him as her life insurance benefi­ciary. Now the Michigan Supreme Court will settle the matter. However, the law does differ from state to state, so if you’ve been living separately from your spouse for a long time, talk to a lawyer to find out whether you might be forfeiting important rights and how you might protect them. Bourdain’s frequent flyer account was almost assuredly large. He built the latter half of his career as a globe trotter, traveling the world sharing meals and exotic food experiences. Though most people probably don’t have as many frequent flyer miles as Bourdain, many do have hundreds of thousands of them. Each airline has different rules and regulations on the transfer of miles after death. Many airlines, such as Delta, have clear policies indicating frequent flyer miles are not transfer­able upon death. However, some of those same policies go on to stipulate that the airline may transfer miles to certain authorized persons at their discretion. In other words, if you include a clause in your will be­queathing your frequent flyer miles, the airline may or may not honor it. You will also want to provide your account number and login information to your executor along with written instruc­tions about who can access your account. Your airline miles may be a way to leave a legacy to some­one after your death. Of course, frequent flyer policies may change at any time. You might be better off using or donat­ing your miles now, while you can, rather than risk losing them after you die.